If you have booked a trip or are thinking of booking a trip, this is your spot to shine! This blog portion of my page is going to be dedicated to all the memorable moments produced here at BACKWATER FISH AND PADDLE! Every rad trip requires a great attitude and a bit of balance. Our rad trips are based on your ability to be able to physically paddle or be outdoors in Florida weather for up to 2.5 hours or more. If that statement made you jump, try not to fall off the boards! While enjoying a trip with us you will definitely want to double check all the personal gear you are bringing before leaving for your destination. All additional gear needed will be discussed via email or phone after or prior to booking. It is good to take note that all of the trips provided are unique and may vary depending on the weather and environment. If you live for outdoors, adventures, paddling, fishing, and camping thrills, you are probably ready to join some rad times!! BOOK NOW and thanks for visiting BACKWATER FISH AND PADDLE. I hope to see you soon! A quick review on some January fun! January had some cold weather which kept a lot of nice fish in the inland rivers and backwaters. I had the pleasure of taking Mark Danner from Tampa area out for some fly throwing action. We worked hard on a cold 40-50 degree day to seek out some redfish on the fly. 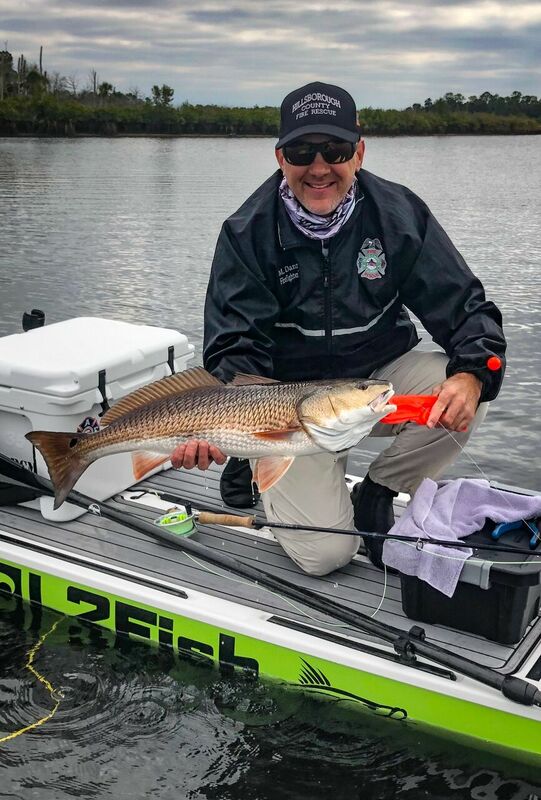 It was definitely a cold day on the water and several fish were spooky but Mark showed me his skills and forced a nice redfish to take a bite of his “candy corn crawler” available at www.backwaterflies.com. Check out his epic first redfish on the fly, along with some other rad fish this month! SUP Fishing Crystal River, Fl.